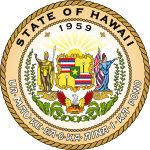 The 2018 Hawaii gubernatorial election took place on November 6, 2018, to elect the Governor of Hawaii and Lieutenant Governor of Hawaii. After prevailing in an intensely competitive primary election on August 11, 2018, incumbent Democratic Governor David Ige ran successfully for re-election to a second term in office, considerably improving on his margin of victory from 2014, in which he only won a plurality. Ige's vote share of 62.67% is the highest of any gubernatorial candidate in Hawaiian history surpassing the previous record of 62.53% set by Linda Lingle in 2006. ^ "Ernest Caravalho". Ballotpedia. Retrieved July 6, 2018. ^ a b c Singer, Jeff (June 6, 2017). "Why several Hawaii Democrats are mulling primary bids against Gov. David Ige". Daily Kos. Retrieved June 6, 2017. ^ a b Hooser, Gary (August 9, 2017). "Brace yourselves, primaries are coming". The Garden Island. Retrieved August 22, 2017. ^ "U.S. Rep. Hanabusa announces plans to run for governor". Hawaii News Now. September 1, 2017. Retrieved September 1, 2017. ^ Callis, Tom (January 3, 2016). "Green saving up for run at higher office". Hawaii Tribune-Herald. Retrieved November 15, 2016. ^ a b Cook Lauer, Nancy (January 6, 2018). "Familiar candidate aims for governor". West Hawaii Today. Archived from the original on January 6, 2018. Retrieved January 7, 2018. ^ Blair, Chad (February 27, 2018). "Former Sen. Clayton Hee Is Running For Governor". Honolulu Civil Beat. Retrieved February 28, 2018. ^ Blair, Chad (June 4, 2018). "Clayton Hee Withdraws From Hawaii Governor's Race". Honolulu Civil Beat. Retrieved June 8, 2018. ^ a b c d e f g h "Primary Election 2018 -State of Hawaii – Statewide" (PDF). Hawaii Office of Elections. Retrieved August 12, 2018. ^ "Kauai Mayor Bernard Carvalho Jr. to run for lieutenant governor". KHON 2. October 26, 2017. Retrieved November 5, 2017. ^ a b "Sens. Green, Espero announce runs for lieutenant governor in 2018". Hawaii News Now. September 1, 2017. Retrieved September 1, 2017. ^ Cook Lauer, Nancy (June 13, 2017). "3 show interest in Green's seat as senator eyes lieutenant gov bid". Hawaii Tribune-Herald. Retrieved August 22, 2017. ^ "Kim Coco Iwamoto announces bid for Lieutenant Governor". Island News KITV 4. November 5, 2017. Retrieved November 5, 2017. ^ "Maui Mayor Arakawa says he plans to run for lieutenant governor". Hawaii News Now. May 26, 2017. Retrieved November 5, 2017. ^ Pignataro, Anthony (April 3, 2018). "Maui Mayor Alan Arakawa to hold $1,000/person fundraiser at swanky Waikiki restaurant". MauiTime. Retrieved April 15, 2018. ^ a b Daverta, Jobeth (Jan 21, 2018). "Hawaii minority leader Rep. Andria Tupola enters gubernatorial race". Hawaii News Now. Retrieved Jan 26, 2018. ^ Dible, Max (April 14, 2018). "Republican candidates for state office stump in Kona". West Hawaii Today. ^ "The Hawaii Republican Party has a new chair". Retrieved 2018-04-05. ^ Nagaoka, Ashley (May 12, 2017). "McDermott touts leadership, officialy [sic] enters 2018 race for governor". Hawaii News Now. Retrieved May 13, 2017. ^ Dayton, Kevin (August 29, 2017). "Rep. McDermott withdraws from governor's race". Honolulu Star-Advertiser. Retrieved August 30, 2017. ^ Beers, Axel (August 2, 2018). "MauiTime endorses Andria Tupola for governor (Republican) in 2018 Primary Election". Maui Time. ^ "General Election 2018 Final Summary Report" (PDF). State of Hawaii. November 6, 2018. Retrieved December 20, 2018.